name it, get to know it and take it by the hand so it can become your friend and ally. Everyone knows fear. It can come in an instant and throw you into chaos, yet it can also save your life. Fear is a natural response to physical danger, but it can also be self-created, such as the fear of failure, being out of control, being different or being lonely. There is a fear of the future and of death. You may fear love because you fear being rejected; fear being generous because you fear you will not have enough; fear sharing your thoughts or feelings in case you appear wrong; and fear trusting because you are dominated by self-doubt and insecurity. This self-generated fear is found in its acronym: F.E.A.R. or False Evidence Appearing Real. It appears real, even though it is a fear of the future and is not happening now. Therefore, it has no real substance, arising when the ego-self is threatened, which makes you cling to the known and familiar. Such fear creates untold worry, apprehension, nervous disorders and even paranoia. The immediate effect of fear is to shut you down, and—in particular—to shut off the heart. Just for a moment, let your body take the stance of feeling fearful. What is your posture? Most people hunch their shoulders forward, fold their arms across their chests, or assume a similarly contracted position to shield the heart, fear having triggered the need to be on the defensive. In this self-protective place, the heart goes out of reach, and you cannot feel love or even friendliness. Try saying “I love you” with real meaning while your arms are firmly folded across your heart—hard to do! As long as you push away, deny or ignore fear, it will hold you captive and keep you emotionally frozen, unable to move forward. In that place, you become untrusting of love and spontaneity; you get angry or hide. But where fear contracts and closes the heart—resisting love—love expands and opens the heart, embracing fear. So now try taking the posture of love. Watch how your body responds, your arms reaching outward, accepting and inviting. Fear may still be there, but love can welcome fear—it can embrace any negativity. Watch how your breathing gets deeper, fuller. Where fear shuts out love, love holds fear tenderly. It is like the sky that contains everything—the stars, the moon, the wind. With your arms stretched wide, try saying, “I’m frightened” and really mean it—hard to do! Remember times you have met fear and moved through it, so many times when fear arose but you kept going? Those are moments of fearlessness. Fear may close the heart, but courage comes out of heartfulness, out of releasing resistance. Fear will stop you from facing your shadow and participating fully in life, but fearlessness will give you the courage to dive into the unknown. In other words, being fearless does not mean you deny fear, it is not a state of being without fear. Rather, it is fully experiencing the fear, naming it, getting to know it and taking it by the hand so it can become your friend and ally. Allowing fear in and making friends with it is no small feat; fear is a powerful emotion that demands understanding and patience. But trying to block it will simply create further anxiety. Fear comes—you breathe and let go. Fear comes—you see how the mind needs reassurance and tenderness. Fear comes—replace it with love. When you do this, you are inviting the fearful and anxious parts of yourself to get to know each other, even to sit down for a cup of tea together. Meditation enables you to be with fear. As you do this, you’ll begin to see the benefits of fear, the unexpected insights and flashes of understanding that move you into courage and a deeper awareness. In this way, fear becomes your ally. Sit comfortably with an upright spine, take a deep breath and let it go. Focus your attention on your breathing, just watching the natural flow of your breath. Staying aware and open, allow whatever feelings are present to arise. Have no judgment, rejection or aversion. Accept whatever you are experiencing as simply a part of what is. You do not need to change anything. Just be with whatever the feeling may bring up in you. Be kind and caring to yourself. Keep breathing and accepting, breathing and being with what is. 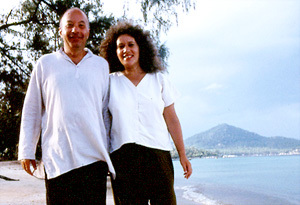 Ed and Deb Shapiro are the authors of Be The Change, How Meditation Can Transform You and the World. They are featured weekly contributors to Oprah.com, HuffingtonPost.com and Care2.com. Ed and Deb write Sprint’s The Daily CHILLOUT inspirational text messages. They have three meditation CDs: Metta: Loving Kindness and Forgiveness, Samadhi: Breath Awareness and Insight and Yoga Nidra: Inner Conscious Relaxation. Deb is also the author of the best-selling book Your Body Speaks Your Mind, winner of the 2007 Visionary Book Award.